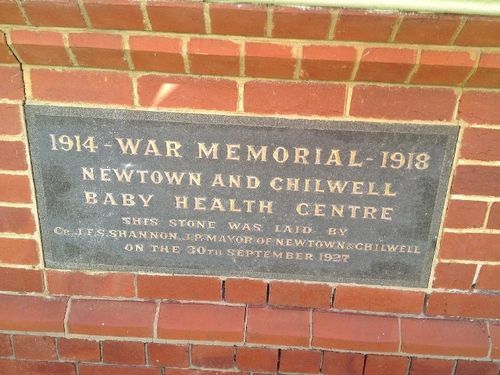 The Baby Health Centre was erected as a war memorial to commemorate those from the district who died in service or were killed in action during World War One. The building was officially opened on the 24th August 1928. Messrs. Laird and Buchan (architects) have completed plans and specifications for the Baby Health Centre building to be erected in Russell Street, and which is to be the Newtown and Chiltern war memorial. The building is to be of brick, with tiled roof. The large waiting room will be given an attractive finish. There will also be a consulting room for nurses, a sister`s room, a room for breast feeding, and all the necessary toilet and lavatory accomodation. The consulting and waiting rooms are to have open fire places in order that visitors to the centre may have the maximum of comfort. A small porch in front will lead to the main entrance. The entire building will be 33 feet by 36 feet. Tenders for its construction close on Tuesday, July 12, at noon. Geelong Advertiser (Vic), 27 June 1927.